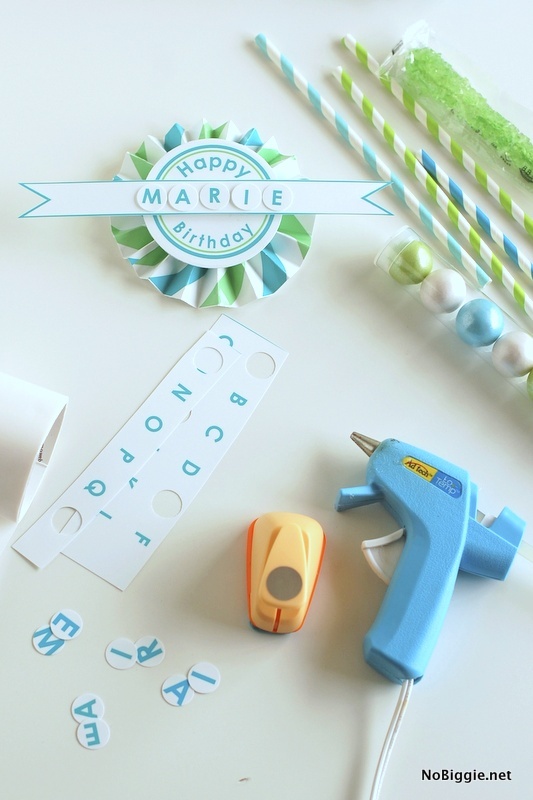 We’re celebrating a blog birthday this week. Seven years ago this week, I started NoBiggie. Although back in 2007 it was originally named: “the biggie blog dot blogspot dot com” (now that’s a mouthful). In 2009 we made the switch to NoBiggie, and we’ve been the same ever since. It seems a little silly to celebrate a blog birthday, but it is fun to mark the years and celebrate all the great things that have come from starting this blog. So this printable is my gift to you! Thanks for reading, sharing, commenting and pinning…mostly thanks for your support! The success of a blog all comes down to good content and the readers who share it, so thank you! 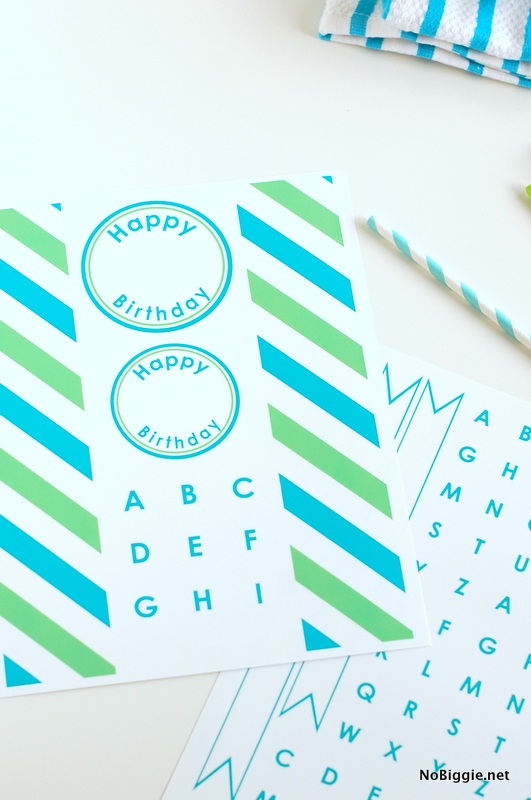 I’m loving this green and turquoise color combination right now. 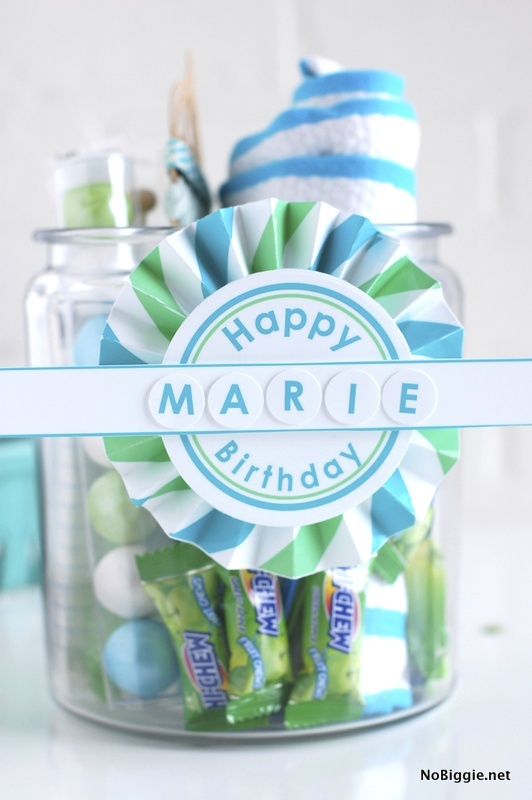 To show you how you can really personalize this printable, I added the name Marie…you can add any name you’d like. This is what the printable looks like when you print it out at home. I love using photo paper for printables. The colors always look so sharp and crisp and I love the glossy look too. To make the accordion folded medallion, you can follow the directions in this post if you’ve never made one before. 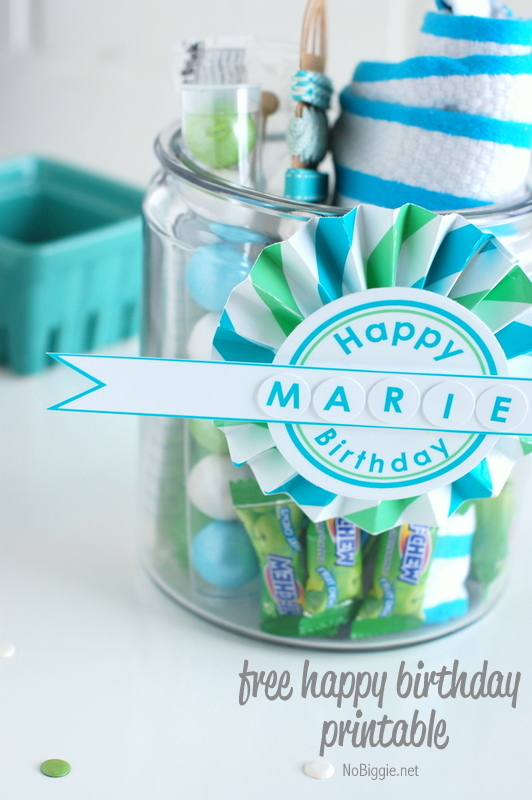 As for the small letters, I used a small circle paper punch to personalize it. 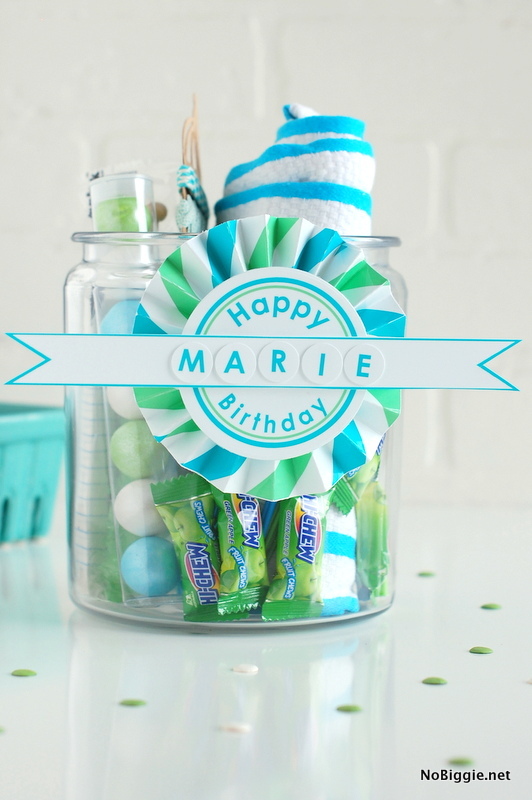 Once assembled, just fill a big glass jar with a bunch of fun odds and ends all within the same color theme of the printable. 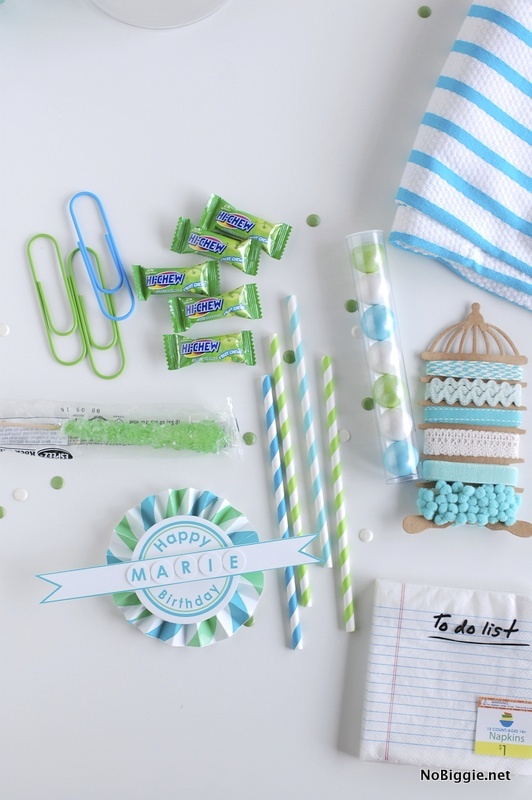 Here’s what we added: giant paper clips, Hi-Chews, a rock candy sucker, a long tube of shiny gumballs, cute paper napkins, stripey straws, different ribbons and a fun striped hand towel. Nothing to break the bank, just a little thoughtful and useful gift anyone would love. The coordinating colors pull it all together, don’t you think? Isn’t it fun?! 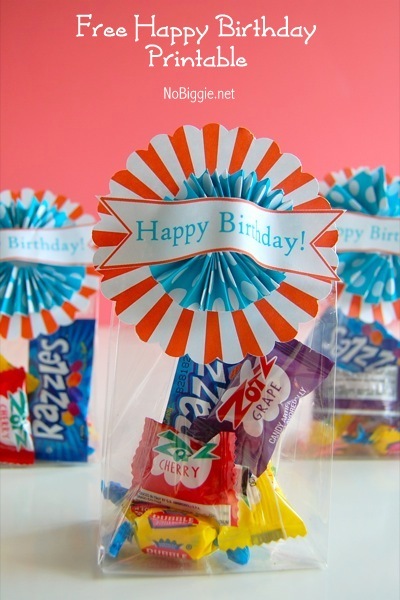 I would love to be surpised with a fun gift like this!